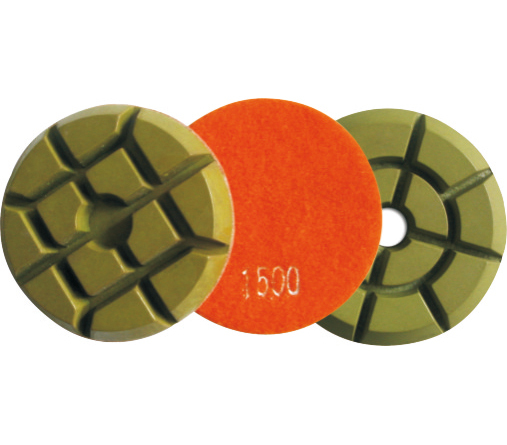 Professional 10mm thick diamond resin polishing pucks designed specifically for polishing concrete dry. Can be used wet but with much reduced lifespan. Available in 75mm or 100mm diameter hook and loop backed. If you have an already flat concrete that need refinishing or a new pour that’s been power floated and is pretty smooth this standard Resin Typhoon pad will be ideal for polishing. The copper version of the Typhoon pad (see our other listing) is ideal if you have a very hard concrete, an uneven surface or you’re looking to cut the surface back slightly. Both systems can be used together and there’s no need to duplicate grits, for instance you could start with #30,#50,#100 in copper then switch to resin at #200 upwards, or whatever works for your particular concrete pour. These generic pads will work on the following manufacturers machines. Klindex, Husqvarna, Blastrac, Skanmaskin, HTC, Terrco, Werkmaster, Lavina & Prepmaster with the appropriate hook & loop backer for your machine.